Defending from an attack behind the net can be a tough play for defensive players. 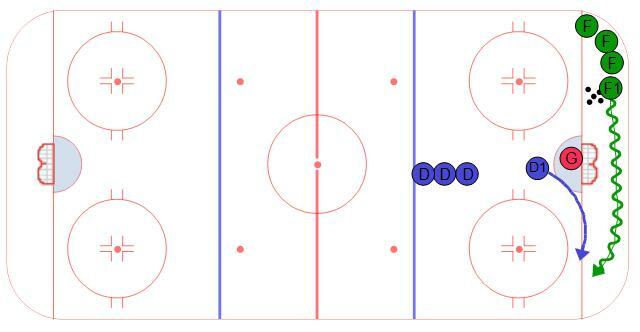 This hockey drill is set up for defense to work on these situations. Forwards form a line below the goal line about even with the dots and facing the net. The defense should line up in front of the net a couple of feet in front of the crease with their heels pointed to the net. The forwards start the drill by carrying the puck behind the net. Once they reach the far post their goal is to try and get to the front of the net for a scoring chance. Using their stick and good angles, the defense tries to force the forward to the outside and up the wall.